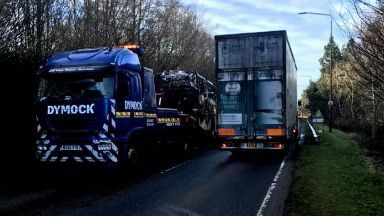 The coach went on fire while travelling on the A71 in West Lothian on Monday morning. A school bus had to be evacuated during a morning run in West Lothian after a fire broke out on board. The coach, operated by E&M Horsburgh, went up in flames on the A71 at the Wilderness Roundabout at Bellsquarry near Livingston shortly after 8.30am on Monday. 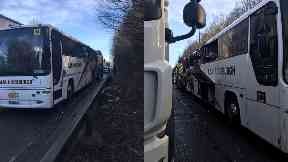 It is understood a number of West Calder High School pupils were on board, however no one was injured in the incident. Concerned father Daniel Fuller feared his daughter was on the bus and immediately drove from his home in Bathgate to the scene. He told STV News: "Luckily my daughter wasn't on it. "Fortunately no one was hurt, but the flames spread right through the bus. "It could have been worse - that's the scary thing about it." West Lothian Council advised drivers to avoid the area, posting on social media: "Everyone is safe and emergency services are on the scene." The Scottish Fire and Rescue Service confirmed three engines responded. A spokeswoman said: "The Scottish Fire & Rescue Service was alerted at 8.31am to reports of a bus on fire in Livingston. "All people were accounted for." The fire crews issued the stop call at 9.42am and thereafter left the scene. A spokesperson from E&M Horsburgh said: "We can confirm that one of our vehicles was unfortunately involved in a fire incident this morning. "There were no passenger injuries as a result of this fire. The cause of the fire is now under investigation. "E&M Horsburgh was established in 1986 and holds an exemplary safety record."